Ergotech’s new desktop riser, the One-Touch Free Stand, represents a step in the right direction for electric-powered risers. Its main competitor, the tankish Taskmate Executive, seems like an anachronistic behemoth next to the comparably sleek and customizable new riser. up to four ≤27" monitors, depending on the model. Tons of customization options. Can accommodate up to four monitors. Massive 100lbs weight capacity. Easy one-touch electric height adjustment is quiet and smooth. Monitors are somewhat difficult to tilt/pan/rotate. Installation is a bit complicated. Aesthetic is a little bit industrial, with motor and cords exposed. 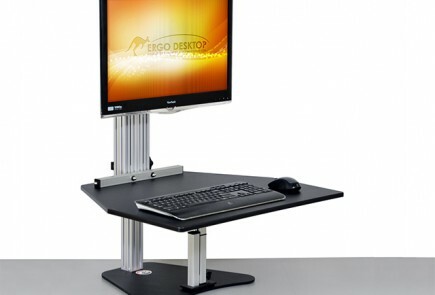 When the topic of the sit stand workstation comes up in a conversation with a customer, we typically point them to one of two mainstays: Ergotron’s Workfit-S or Ergo Desktop’s Kangaroo. Both these options provide a solution to those who either can't or just don't want to give up the sitting desk they already have. The most popularly-recognized sit stand workstation of all, of course, is the more rudimentary VariDesk, but that has since been overtaken by Ergotron's Workfit-T, which provides the same ease of use, but with new ergonomic improvements. At the same time, new contenders like the Humanscale Quickstand and Winston Workstation have arrived on the scene to stake their own claim on the rapidly-expanding market for desktop workstations. A sit stand workstation is typically manually-operated, relying on tension springs or pin-and-socket locking positions to hold monitors in place and allow users to adjust from sitting to standing with ease. But a new addition to the mix is the electric sit stand workstation, which replaces these manual parts with a motorized adjustment mechanism. These electric models aren't as widely-accepted as the simpler manual models, usually due to a jaw-dropping pricetag and an oftentimes cumbersome design. Just look at Health Postures' TaskMate Executive, which suffered from an inefficient design and cost more than many stand up desks. Now, however, electric sit stand workstations are more powerful, more sophisticated, and more affordable. Ergotech’s new One-Touch Free Stand sit stand workstation represents a step in the right direction for electric-powered sit stand workstations in regular office applications. Ergotech is known across the board as a manufacturer of LCD monitor mounts. In particular, they are an industry leader when it comes to multi-monitor configurations commonly found in command and broadcast control centers, medical monitoring stations, and call centers. The One-Touch Free Stand, Ergotech's first foray into the sit stand workstation market, is especially designed for these monitor-heavy offices, with its unique capacity to accommodate up to four monitors at once. New users opening the Free Stand box for the first time are greeted with a wide array of aluminum and steel parts, and it isn’t immediately clear how they come together. Assembly instructions are included, though the quality of the photos made them a bit tough to decipher. Installation doesn’t require any special tools; all you need are the hex keys included and the components’ screw clamps. It isn’t the quickest or most intuitive installation process we’ve seen on a sit stand workstation, but with a little patience and diligence it’s easy enough to put together. Since our initial evaluation, Ergotech has released high-quality manuals, so new users can expect a smoother assembly process. Aesthetically, there's quite a bit to be desired. The One-Touch's aluminum construction gives it a rather industrious look that may be incongruous in a modern office setting. Aside from a metal mesh positioned behind the assembly, Ergotech has not done anything to conceal its innards. As a result, you're treated to an unobstructed view of the motor and a number of attachment parts connected to each other. We prefer the aesthetics of something like the Quickstand, which conceals the the moving parts into a single column. The Free Stand comes with two platforms: a 10”x28” keyboard tray, positioned underneath a 13”x28” work surface. You have the option of getting a standard keyboard tray, designed to be flush against the table top at its lowest height (useful for mounting the workstation farther back on your desk) or a dropped keyboard option for front edge-mounted units. Usually the top platform would be used to hold your monitors up. The review unit we tested - a PC version (there's a Mac version available as well) came with a mounting kit for VESA-standard monitors. Ergotech offers both a single and a dual monitor mounting kit as an optional upgrade to the base Free Stand unit. This monitor option is the recommended setup from an ergonomic perspective to best configure the sit stand workstation to your own eye level, rather than having to crane your neck down to look at a laptop screen. The height-adjustment controller switch is embedded in the top platform. It's easy to reach, but does take up some of your work surface space. The Free Stand offers users a wide range of adjustability options. It has 20 inches of electric height-adjustment range, and the motor is rated to lift an impressive 100 pounds. That's about three times as much lift capacity as the brawniest manual workstations. Such weight lifting ability is great for multi-monitor users who may want to fit four monitors on a single workstation. We should be clear that this lift capacity is for the monitors themselves. It doesn't apply to the work surface platforms, which are fine for papers and light items but are too thin and flexible for heavier items. For our money, we have a slight preference for the Electric Kangaroo, which can lift 100 lbs and has a thicker, more substantial work surface. That said, most users will run out of space on their work surface well before they reach either of those weight limits. The Free Stand's reasonably quiet motor moves the entire platform up and down at a speed of 1.25 inches per second, almost as fast as best-of-breed adjustable-height desks, and almost as quiet. In sound level testing the motor noise at the user's ear ranged from 46 to 49 dB, although an occasional rattling noise was heard during descent from the top of the stand that peaked at 75 dB. We suspect that this stems from some parts not being completely secured to each other, resulting in them rattling around during height adjustment. The keyboard tray can be set to one of five positions, to a maximum of seven inches below the work surface, and can achieve up to 12 degrees of negative tilt, for more ergonomic typing angles. If you purchased the monitor mounting kit, you also have the ability to adjust your screens independently. You set the mounting bricks of your kit to the desired position along the central shaft, and then affix your monitor to the VESA brackets. We're not big fans of this form of monitor adjustment, especially since many sit stand workstations, including the electric kangaroo, have a gas-assisted mechanism for monitors that's safer and more elegant. You can further adjust the height of your monitor incrementally using a knob at the top of the VESA bracket. You can also tilt, pan, and rotate your monitor, though the mechanism is a bit stiff and not very user-friendly. The FreeStand incorporates ErgoTech's Ergotech's signature quick-release monitor-mount design, which lets you detach your monitors in a single motion by pulling a pin on the VESA bracket. While this does allow you to quickly remove your screen – making it easier to adjust the height of the monitor – it's not something you'll want to do throughout the day – for those incremental height adjustments, there is a knob on each bracket. The One-Touch Free Stand can be installed through a table’s grommet hole, or along its back or front edge. Additional mounting options also include the ability to set the workstation on a wall or on a desk-mounted rail, which allows the whole assembly to slide to different positions along the depth of the desk. 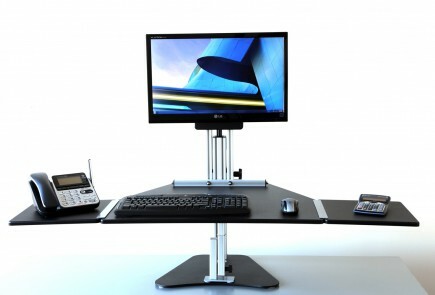 The electric sit stand workstation is still a new concept, and you could do far worse than the One Touch. One of the older electric models is the Taskmate Executive, an absolute behemoth of a sit stand workstation that costs more than many electric desks. It is heavy, takes a wide footprint, looks like military equipment, and has a rather small lifting capacity. 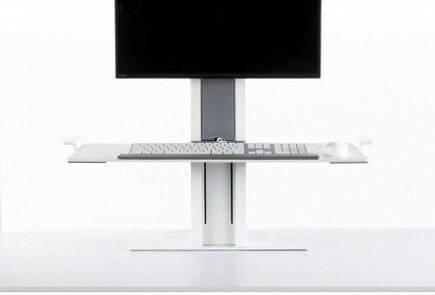 In contrast, the Free Stand is slim, lightweight, and takes up less desk space. Yet despite the comparable svelteness of the Free Stand, it manages to outperform its intimidatingly heftier competitor. Its 100 pound lift capacity is double that of the Taskmate’s, and it has a taller maximum height as well. The One Touch Free Stand's only real competitor is, as you might have guessed, the Electric Kangaroo. The standard, manual Kangaroo has been around for a few years now, and we're glad to see that their new electric variant provides the same thick, customizable work surface and stabilization leg—not to mention a $200 lower pricetag. Unless you require more monitors than the two the Electric Kangaroo supports, we think the One Touch isn't quite as robust a workstation as the Electric Kangaroo. This new workstation can be customized to suit your particular needs. You start with one of two base models. The One-Touch Free Stand, which starts at a cool $799, comes in either a PC or Mac variant, and includes the keyboard tray and work surface. You have the option of purchasing a mounting kit for up to two monitors. Additional attachments include a laptop tray, an LED task light, and AC/USB ports. For the most dedicated users, the $849 One-Touch Ultra sports bigger work surfaces and the capacity to mount four monitors side-by-side, maximizing your screen space. While there is a multitude of sit stand workstations on the market, many of which come with a smaller price tag, the One-Touch—with its impressive height and weight capacity, multi-monitor configurations, and smooth electric adjustment—is a capable workstation that make even some of the more monitor-heavy setups stand-friendly. With the sudden growth of the sit stand market, we're excited to see the future of this electric riser.